The fastest and easiest way to support the work of the Great Books Foundation is to give online. 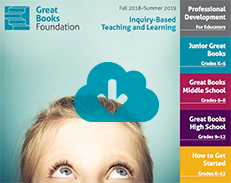 Your unrestricted gift to the Great Books Annual Fund supports life-changing initiatives for adults and Great Books programs in K–12 schools across the country. Give Now. A tribute or memorial gift is a meaningful way to honor someone special in your life—an influential teacher, a longstanding participant in a Great Books group, or a friend or family member who loves books. Give Now. Your monthly gift, at an amount that is comfortable for you, provides a consistent and reliable source of funding for programs in K–12 schools and communities across the country. Give Now. To use a credit card, please Give Now. If your employer has a Matching Gift Program, it can double or triple your gift. When mailing a contribution, be sure to enclose a Matching Gift form from your employer. We will process the paperwork and send you an acknowledgment (and thank you!) upon receipt of your employer’s gift. Give Now. With a planned gift to the Great Books Foundation, you can help secure the future of the Great Books mission, realize potential benefits now as well as to your estate, and create your own legacy of generosity. You will ensure the growth of vital Foundation programs for future generations. The Great Books Foundation is a 501(c)(3) nonprofit organization that depends in part on contributions. Your tax-deductible contribution is greatly appreciated. For any questions or if you wish to discuss a gift, contact Valentina Texera-Parissi, CEO, at 312-646-7112 or use the form below.